The rock star wrote on his website that his doctor organised scans, the latest of which was on Monday, after he complained of severe pain that affected his ability to stand up. MRI scans showed there were "abnormalities in the bones", leading to further investigation over the Christmas period. Brian, who has been leading a campaign against the culling of badgers, said he was feeling optimistic despite the health scare as the results of tests so far have revealed no sign of cancer. The 66-year-old said in a website post on December 28 that he started to get "bad pains in the backside" three months after having knee replacement surgery earlier this year. He said: "So around Christmas I've been having a succession of blood tests, ultrasounds, and various kinds of scans, to see if they could rule out various kinds of cancer. "Now, on hearing the 'C' word something happens inside you ... of course. I've seen so many of my dear friends fighting it ... and my Dad lost his battle at age 66, exactly the age I am now. "So over the last few days I've been in various states of unrest. But the great thing has been that the team my GP assembled to check out the possibilities has moved Heaven and Earth to gather all the information I need quickly over the Christmas period ... not an easy time." 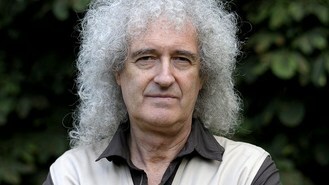 An update on brianmay.com today thanked supporters for their kind words. Brian, married to actress Anita Dobson, wrote: "I've been overwhelmed by the amazing messages you've been sending me, folks, since I wrote about my 'Health Scare'. "It's taken me by surprise - for many reasons. I really didn't realise how much you guys were gunning for me ... it's great to know that, and I can't thank you enough. It puts a smile on my face. "But I didn't realise that biting the bullet and mentioning the 'C' word would unlock such an avalanche. I now realise that so many of you have been wrestling with this all along, personally, or in family or friends, and, like me, found it hard to share. Hearing of your experiences, and courage, and hopes, and solutions, has been a massive eye-opener for me." He said he would know more soon and was getting on with preparations for a forthcoming tour while he waited for the results. Specialists have been "really positive" and told him that even if tests did reveal cancer, it would be "almost certainly treatable with success", he added. His publicist said he would not be making a statement in addition to the musician's posts on his website. Justin Bieber has seemingly announced that he is retiring. Last Christmas was Spotify's most streamed song in the UK on Christmas Day.